Wow, in record time I finished and blocked the Twilight Akimbo!! This took me a week to knit up, but really, it could be knit in a weekend. I wasn't knitting solely on this project the entire time. I had actually finished and blocked this a few days before I left for Nelson, hoping that I could bring it with me to wear. Then I realized that it was July in Nelson and therefore would be sweltering hot and there is absolutely no need for a shawl/scarf at this time of year! Since Victoria has been hit with a record-breaking heat wave, it also took me a while to get some "action" photos. 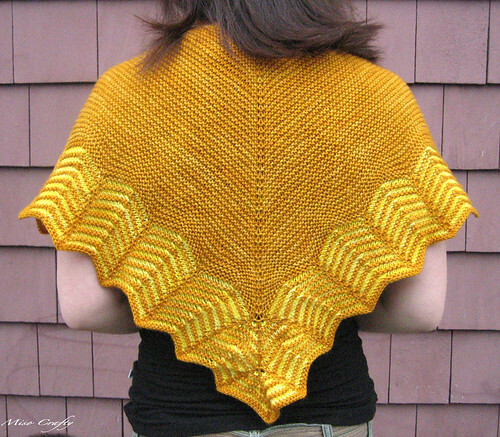 Of course, it's been gorgeous and sunny all week and the one day I'm able to photograph my FO (finished object) it's overcast and gloomy outside! Ha, go figure! There's really not much to tell about this project, other than the fact that this was my first time knitting and blocking a shawl. I have to admit that I didn't do a gauge swatch and had looked on other people's project pages to see what needle size they used. I was feeling pretty lazy to do a swatch, not to mention that I just wanted to jump in and get started and had figured that gauge didn't really matter for this particular project since it's an accessory and not a fitted garment. The worse that could happen is that it could end up either really big or a tad smaller than what it should be. Either potential outcome was something I could deal with. Lucky for me, it came out slightly bigger than what it was suppose to be at, and I think if it were any bigger it would just be too overwhelming on around my neck. The pattern was very straightforward and had enough going on to keep you somewhat interested, even though you are knitting garter stitch. I think it's a great pattern that garners quick results for that instant gratification feel, and in my opinion, the perfect pattern to start my shawl knitting. 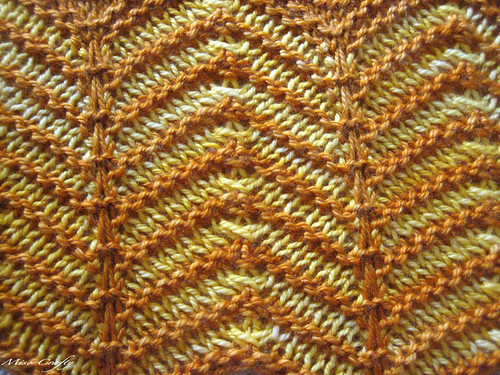 When I finally got to the chevron pattern, that's when the knitting got really interesting and the shawl was just flying off the needles. To me the chevron pattern was quite addictive and I couldn't put the project down cause I wanted to see how the rest of was going to turn out! I did make 2 little boo-boos that ended up as holes in the final product, which you can probably see in some of these photos. There are 2 spots along the center that look like holes...yeah...I had bulky stitch markers in place and while the knitting in that area was tight at times, I had forgotten to yank on the yarn as I was knitting by. So the the extra slack caused the holes when I blocked the shawl. Oh well. Like I said, this is my first shawl and so it's all a learning experience! I really had no idea how to go about blocking a shawl, but from what I've read in knitting blogs a thorough wet and aggressive blocking is the answer. Oh, and a ton of pins. I lucked out a bit, prior to blocking my Akimbo I had read the Yarn Harlot's blog entry about how she blocks her shawls (I was reading her earlier posts since I had only started reading her blog a year and a bit ago...I had a lot of reading to catch up on!). She had some great and really helpful tips and tricks. Since I don't own blocking wires (yet!) she suggested threading straight edges with scrap yarn and pulling it so it's straight, takes the pain out of trying to pin it straight only to get a little scalloped line!! Brilliant! Another handy tip, which is really common sense but for those of us new to shawl blocking, would have never cross the mind: pin out the middle or longest part first before alternating the pinning of each side. 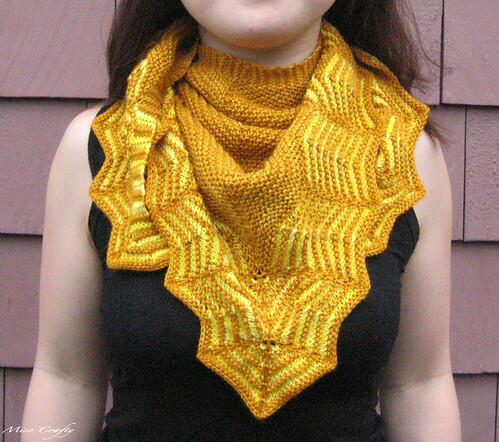 Makes for quite an even shawl. Thank you Yarn Harlot! This piece took 2 days to dry (it was cold and gross weather at the time) but once it was and I got the satisfaction of taking out the 50+ pins, I fully comprehended the magic that is blocking. When on the needles the shawl was an unimpressive blob of yarn that I was sure was going to be really small. 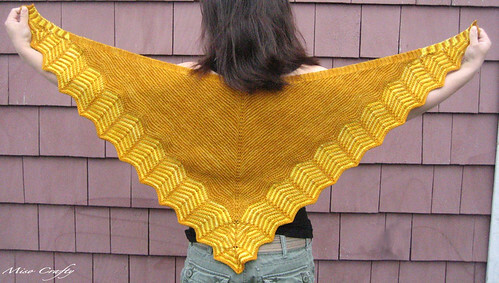 Once blocked, the shawl was a thing of beauty. I've worn the shawl twice now, both times I was a little hesitant as I'm still not sure if the colours are good for me to wear around the face area. Don't get me wrong, I love the colours that I chose and think the colour combo is fab but as someone who doesn't wear much (if any, really) orange or yellow, this is quite the jump! Yet I don't have the heart to give it away. 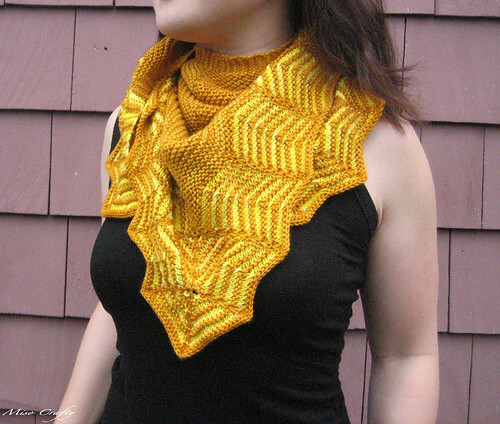 The yarn I used is sooo soft and squishy and such a treat to wear around the neck, how could I give it away?? I used Sunshine Yarns Luxury sock, which is a blend of merino, cashmere, and nylon for the main part of the shawl, and Classic sock (100% merino) for the contrast. I'm so glad that I decided against using the Luxury sock to make a pair of socks and opted to make something that I can fully enjoy that little bit of cashmere! Hey...just wanted to let you know your giveaway package you posted me arrived yesterday. I was having a really crap day yesterday so it was a very nice surprise to come home to. Thank you so much. The scarf is amazing. I wore it last night to watch Corey play soccer.